We have it ALL ready to go!! Great Lakes Graphic Supply has been providing wholesale vinyl sign supplies to the sign trade since 1987. Our customers have accesss to the most innovative products at the most competitive prices in the industry. With over 100,000 feet in stock every day, Great Lakes Graphic Supply always has what you need ready to go. And since we sell our in-stock products by-the-foot with no minimum to order, there's no order too large or too small. We also provide a lot more than standard wholesale vinyl sign supplies. Check out our products and you'll see that we're the one-stop shop for all of your sign-making needs! Great Lakes Graphic Supply has all the sign-making products and accessories you need to get your job done right, at the competitive prices you desire. From vinyl films to digital media and laminates to substrates, frames and more, there's no project too big or too small that we can't supply for. Click below to see our products organized by product category. And feel free to give us a call any time at 1-800-477-6275 and we'll be happy to answer any questions you may have! 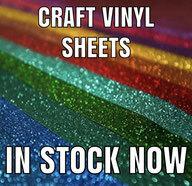 If you're ready to purchase your wholesale vinyl sign supplies right now, then why wait? We've made sure you can purchase all of your supplies quickly and easily. Visit our online store to see our huge stock of supplies covering all of your sign-making needs. If you'd prefer to shop by category, visit our products page. And of course you can order by phone, or you can contact us online to get all of your questions answered and your needs addressed. At Great Lakes Graphic Supply we know the value of working with a real person. That's why a machine doesn't answer our phone. A real person will help you with all of your needs. Someone who can answer your questions and has the knowledge to help you find the right products for your specific application. If you can't find what you're looking for in our online store, or have any questions at all about our products or services, please feel free to call today and discover the difference personal service makes.